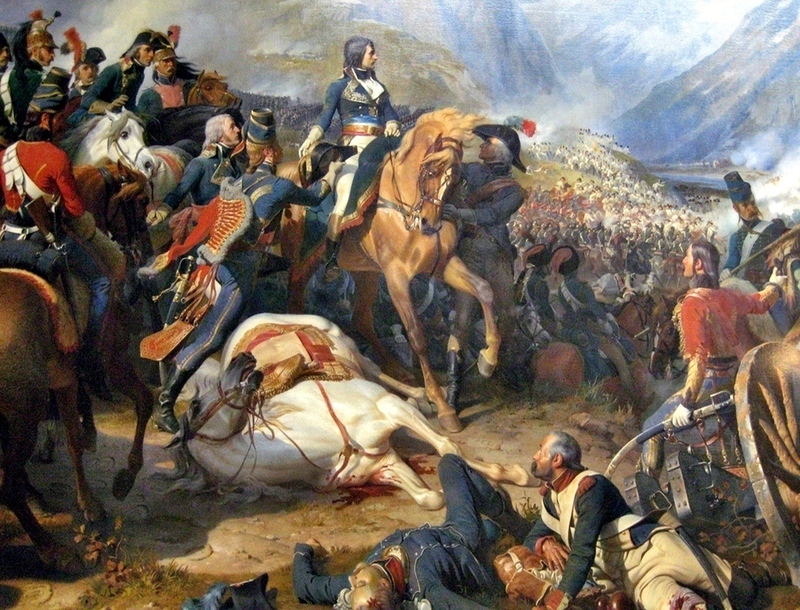 Napoleon would be put in charge of the Italian Campaign (1796) against the Austrians, as a part of the war against coalition forces at that time. This was done, in large part, to remove him from Paris because he was becoming a big name in politics. During this invasion he would receive the nickname of “the Little Corporal,” but contrary to popular belief it was not a reference to his height as much as it was his attitude. He may have been a bit short (at 5’7”) for military service but he was actually above average for the time period he lived in. The nickname came from his unique ability to act as if he was “one of the guys” without sacrificing his role as a leader. While this would change in later years, his early charisma with the troops would help propel him to even higher positions. steal an estimated $45 million in gold and silver along with a number of other objects, like priceless works of art. This decision would unite his men behind him in ways other leaders could only hope, but it was done on the backs of the local people and would make them hate the French. One aspect of Napoleon’s personality that was extremely important to his later achievements was his ability to make bold decisions. When he arrived he inherited a position in which his men were outnumbered, had no chance of being resupplied with troops, and had been fighting in a stalemate for 3 years before him. He chose to attack immediately after arriving and would beat the armies of Austria and Piedmont that were nearest his position in 2 weeks. He would continue a trend of causing massive casualties to the other side while suffering much less, losing only 6,000 men, but killing a total of 25,000. The French would continue by taking the Papal States (the Popes land), but argued against dethroning the Pope, worrying that this would create a power vacuum that someone else will fill. Napoleon then marched on Venice and forced the surrender of the city, ending 1,100 years of independence. During this attack he would allow the French to loot the treasures of the city which resulted in the famous theft of the Horses of Saint Mark. The Austrians would be forced to negotiate a peace treaty largely because of the actions of Napoleon. France was given control of Northern Italy and secretly promised Venice to Austria in this Treaty of Leoben (1797). This became a huge propaganda victory for the French, who ended up looking like a powerful army again. Many historians have debated why Napoleon was such a great military leader. He is generally considered to be one of the best generals in the history of the world due to his clever tactics. Interestingly, he nearly never developed any new tactics, he simply was gifted at seeing which tactics to use at the right times. He actually had a photographic memory and knew the entire military manual on battle tactics by heart. In battle, he would use this photographic memory to counter every move the enemy made with the perfect textbook reaction, which caused nearly every victory he ever had. In fact, he was quoted once saying that he never learned anything from any battle he ever had. There were other aspects of his military career that added to his special nature though. He was a phenomenal motivator, and no matter how his tactics changed, his men would follow him with a passion that is not often seen in history. His decision to let the troops loot (steal) from the local populations would aid the love the troops had for him to a large extent, but there were a number of other ways he received their admiration. He also used espionage and deception quite well in comparison to his peers. Though this is a side of him that is often ignored, his ability to use the information gathered from these activities to help overwhelm the enemies and force them surrender is second to only Genghis Khan.